John Hardy earrings from the Kali Collection. 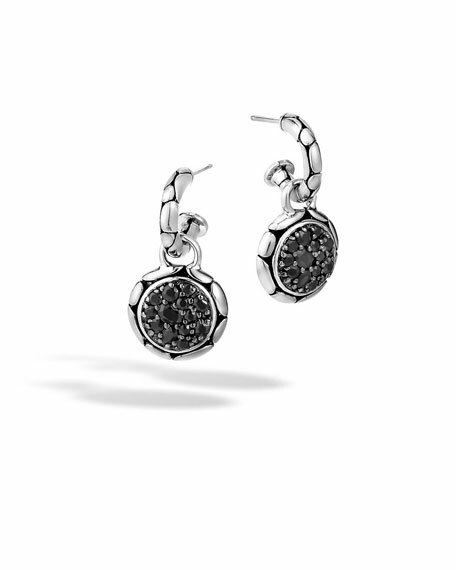 Round drops with pavé black sapphire. Kali, which means river in Balinese, drew its design inspiration from the water-smoothed stones that line the streams of Bali. The motif is highly polished freeform pebble shapes set in a random pattern, heightened with deep oxidation. Kuu dark horn earrings by Ashley Pittman. Signature hand-inlaid bronze hardware. Round post with open dark horn drops. Triangular drops with bronze dotting. Post backs for pierced ears. Approx. 2.2"L drop. Handcrafted in Kenya. Gem Rianne drop earrings by BaubleBar. Shiny golden plating over hardware. Glass seed bead posts and drops. Approx. 2.8"L drop; 1.8"W. Surgical steel posts backs. Imported. Coco flower earrings by Jennifer Behr. Black hand-painted brass hardware. Stacked large and small flowers. Swarovski® pearls at centers. Post backs for pierced ears. Made in USA.